The god Ninurta has been described in the handbooks of mythology as the warrior god and the god of hunting, and sometimes his role as the patron of agriculture has been emphasised in the scholarly literature. These are important aspects of Ninurta and the definitions are correct. The god Ninurta is a very complex figure and in the present paper I will deal with his aspect as scribe and the god of wisdom, a role which has not been much discussed so far. Ninurta is the city-god of Nippur, the city of letters, where more than 80% of all known Sumerian literary compositions have been found (Gibson 1993). It seems inevitable that scribal activity in the city must have been patronized by some god of the city. Ninurta is a suitable candidate for this role. There is some evidence which confirms that Ninurta is a god patronizing scribal activities. In later Babylonia, the god of scribal arts was Marduk's son Nabu. In my paper I will claim that the relationship between Marduk and Nabu was modelled on the relationship between Enlil and Ninurta and Nabu's role as the scribe among the gods was the inheritance of Ninurta. A Sumerian myth Ninurta's journey to Eridu describes Ninurta's acquisition of powers in Abzu and he determines the fates together with An in assembly (see Reisman 1971). This myth is an etiological myth. Eridu housed the god of wisdom Ea and his abode Abzu was mythical source of the divine wisdom. According to my view this Ninurta's journey to Eridu was an etiology how Ninurta obtained his wisdom among the other powers for the benefit of the land. In Babylonia, Ninurta's successor Nabû lived in Borsippa, where his temple Ezida had a by-name bīt ţuppi "the tablet house". 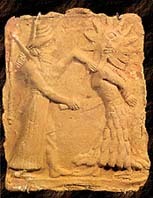 Ninurta's connection with the Tablet of Destinies is attested in the poorly preserved Sumerian myth "Ninurta and the Turtle". Ninurta's wisdom and his passion for the scribal arts are attested in his epithets. In Lugale he is called "the very wise" (gal-zu, ln. 152) and "gifted with broad wisdom" (gíštu-dagal, ln. 153). When Ninurta blocked the powerful waters threatening the land by means of stones in the epic, he is described to have applied his great wisdom and cleverness on the situation (347ff.). The Standard Babylonian epic of Anzu describes how Ninurta took hold of the Tablet of Destinies in the battle against Anzu who had stolen it. The possession of the Tablet of Destinies was also an important characteristic of Babylonian Nabu in his capacity as the god of scribal arts. We know that the Anzu epic existed already in an Old Babylonian version which told the same story. So I feel confident to claim that as the holder of the Tablet of Destinies, Ninurta precedes Nabu. In the Standard Babylonian version, after Ninurta's triumph over Anzu the great gods entrust to Ninurta a divine secret. By seeing the sign of Ninurta's victory, Dagan rejoices, summons all the gods and says to them: "The mighty one has outroared Anzu in his mountain ... Let him stand with the gods his brethren, that he may hear the secret lore, [let him hear] the secret lore of the gods" (III 26.30-31). The knowledge of the secret lore (pirištu) is an award which was not promised to Ninurta by the mother goddess before he went to the battle, but attested in the other sources. Ninurta was called šēmi pirišti "who has heard the secret" (Lugale 153, še-uraš), or bēl pirišti "the master of the secret lore" (see van Dijk 1983: 6). Among the mystical names which are given to Ninurta in the epilogue of the Anzu epic is E-Ibbi-Anu (III, 133) which is explained as 'Master of the Secret Lore' (bēl pirišti - en ad.hal). There exists a remarkable inconsistency in the Anzu epic in regard to who is Ninurta's father: throughout in the epic it is Enlil who is called the father of Ninurta (I 208, II 19.22) until in II 101 it is surprisingly Ea (cf. SAA Anzu III 159)! Marduk or Enlil and Ea/ Enki also alternate as fathers of Nabû, the Babylonian god of scribal arts (Pomponio 1978: 161-68). Thus the Epic of Anzu offers enough evidence that Ninurta was a wise god who controls the tablet of destinies and this must be related to his role as the god of the scribal arts. The Babylonian god Nabû has taken over these roles to which Sumerian Ninurta of Nippur was the ancestor. Ninurta's wisdom is probably connected with his swiftness. Ninurta's victory over his enemies was celebrated in the first millennium rituals by a cultic footrace. Swiftness celebrated in these rituals originates with the swiftness of attack by which Ninurta defeated the enemies, but it is also swiftness in understanding. Ninurta is like a victorious king on the military operation who realizes quickly the intentions of enemy and how to vanquish them. The swifter computer the better it is as we all know. During the second millennium the role of scribe was taken over by Nabu from Ninurta in Babylonia. Ninurta's importance was revived in Assyria by the kings Tukulti-Ninurta the first and Assurnasirpal the second, but from the middle of the eight century Ninurta's role seems to have given to Nabu in Assyria. There are some epithets which attest Ninurta as the god of scribal arts. Like Nabu, Ninurta is sometimes called "sage of the gods" (apkal ilāni), for example in the royal inscription of Assurnasirpal II (Grayson 1991: 194, ln. 5 & parallel 229, ln. 9). In the hymn to Ninurta as the helper in misery, edited by Werner Mayer (1992), the god is in one section described in terms of a scribe: ummânu mudû ša kīma šāri ana mihilti iziqqa u kullat ţupšarrūtu kīma gurunne ina karšišu kamsu "the wise scholar, who like a wind blows (= yearns for?) towards cuneiform signs and (who) has all the craft of the scribe packed into his mind (= stomach) like beer" (section xix). Ninurta is further called the "scribe of Ešarra" (šāţir Ešarra) in a Babylonian ritual text edited by B. Pongratz-Leisten, ina šulmi īrub, text no. 17, ln.9. Certain kinds of practical documents were associated with the god Ninurta. Piotr Steinkeller in Sale Documents of the Ur III Period published five Nippur sale documents (nos. 22, 27, 29, 59, 60) which use an oath invoking the god Ninurta and the king (mu dnin-urta mu lugal-bi ... pàd). A similar oath occurs already in a Sargonic tablet from Nippur" (ibid. : 73). Some formal similarities between these documents suggest that these may have been products of the same group of scribes, who resided in the same quarter of Nippur. A plausible explanation of this kind of unusual invocation is that at Nippur judicial matters were Ninurta's domain (Steinkeller 1989: 73, n. 209). Thus Ninurta had a legal authority in the Ur III period. The "gate of Ninurta" (and of Enlil) in Nippur are the centres of legal activity concerning property sales. A similar situation appears in Old Babylonian Kisurra. The Manual of Sumerian Legal Forms indicates that trials in Nippur were held in the courtyard of Enlil's temple Ekur and in one document Ninurta's gate appears as a site for oaths. At least once, a man took an oath there because he couldn't provide witnesses or show a tablet (see Lieberman 1992). The seal of Ninurta with the inscription "Ninurta, great ensi (ensigal) of Enlil" is impressed on one sale document (Seinkeller 1989: 238, doc. 62; see Artzi 1999: 363). Ninurta is called "Enlil's sealkeeper" (kišib-gál or kišib-lá), the "sealkeeper of father Enlil, he who makes the great me's perfect" in the Sumerian collection of temple hymns. In Angimdimma line 93., Ninurta is called the "seal-bearer of Enlil" - kišib-lá den-líl-lá, (see Cooper 1978: 72 and comm.) and Lugale 235-36 states: Storm of the rebel lands, who grinds the Mountains like flour, Ninurta, Enlil's seal-bearer, go to it! Sumerian legal taboos are often those of Ninurta, as William Hallo (1985: 24) has pointed out. For example (YBC 7351): "A judge who perverts justice, a curse which falls on the righteous party, a (first-born) heir who drives the younger (son) out of the patrimony - these are abominations of Ninurta" (di-ku5 níg-gi-na hul-a/ áš á-zi-da bal-a/ dumu-nitah-tur-ra é-ad-da-na-ka/íb-ta-an-sar-re/ níg-gig dNin-urta-ke4). A variant of this taboo attests Utu instead of Ninurta (UET 6/2 259, see ibid) and the Proverb Collection 14 attests a further variant: "To seize someone with unauthorized force, to prounounce an unauthorized verdict, to have the younger (son) driven out of the patrimony by the (first-born) heir - these are abominations of Ninurta" (Hallo 1985: 24). Ninurta is a protector of justice. From a legal document from Samsuiluna's 23rd year (BE 6/2, 58: 1), it emerges that Ninurta's weapon urudušíta situated at the gate of his temple in Nippur, before which one could take witness. In another document from Samsuiluna's first year (BE 6/2 62), a culprit has to stand "on the gate of the heroes' garden, before Ninurta" for taking witness. Another Ninurta's weapon, Udbanuilla was installed for trials before the gate ká du6 ur-sag-e-ne "gate of the heroes' mound" in Ninurta's temple, before which oaths could be sworn. Later in the first millennium Babylon according to topographical texts, Marduk's divine weapon Muštēšir-hablim "who does right to the wronged" stood in the part of Esagil which was called é.di.ku5.mah, "the House of the Exalted Judge". This tradition certainly derives from traditions of Ninurta and Nippur, because the Marduk's weapon Muštēšir-hablim is equated in an explanatory list together with dgiš.tukul.dšà.zu with weapons of Ninurta, dšár.ur4 and dšár.gaz (George 1992: 293). We can see how Ninurta's weapons were used as means to provide justice and to positively affect legal affairs. Ninurta makes a strange reappearance in judicial matters after a very long time span in the urban complex of Emar (13th century), as pointed out by Pinhas Artzi at Rencontre in 1994, 7 years ago in Berlin. In Emar it appears that the city god whose name is written sumerographically Ninurta and his seal have very important status. Ninurta is the divine owner of the land under whose sealed jurisdiction the actions of state authority are legalized. In conjunction with the King and the Elders or "the Great Ones" the sales of land or other property and gifts or confiscations are carried out. Artzi remarks: "This entire legal complex around Ninurta constitutes the fundamental Babylonian contribution to the statehood of Emar." (1999: 362.) Ninurta of Emar is genealogically the "son of Dagan" based on the Old Babylonian equivalence of Dagan and Enlil. Ninurta in Emar protects even the actual wording of the tablet in legal transaction. One document, published by A. Tsukimoto states that "whoever changes the words of this tablet, let Ninurta make his name and seed disappear". Enlil's scribe and seal-keeper in Nippur was Ninurta, and it is plausible to assume that this relationship had a legacy on the later periods. Also Ninurta must have had in Nippur the functions of a scribe who occasionally noted the legal affairs. Still another office of Ninurta in Nippur was pertinent to his role as the god of wisdom. Ninurta as scribe belonged to the assembly of gods who determined destinies in heaven and earth and the destiny of the mortal kingship. Ninurta bequeathed his role to his Babylonian successor Nabû. In the canonical lamentation "He who Makes Decisions in the Council", the princely son Nabû decrees a good destiny for the cities including Babylon and Nippur and in the most important temples of the land and calls them by a good name. Ninurta's role as the sealkeeper of Enlil had a clear legacy in Assyria. The administrative centre of Assyrian Empire, bīt āli "City Hall" in Assur had a ceremonial name in Assyrian Temple List "where the Tablet of Destinies is sealed as a secret" (George 1986: 140). In Neo-Assyrian times the ceremonial name of the same building is attested as "House, edifice where the Tablet of Destinies is Sealed" (ibid. 141). Thus in the Assyrian tradition the seals of the god Assur were kept in the City Hall and not in his main temple Ešarra. The City Hall in Assur was intimately connected to Nabû's temple according to the topographical texts. In the same way as Ninurta in Nippur was the seal-keeper of Enlil, are the seals of the "Assyrian Enlil", Assur, kept in the temple of Nabû. For example, the copies of Esarhaddon's succession treaty were found in the Throne Room of the Nabû temple in Calah (Pongratz-Leisten 1994: 97). The temples of Nabû at Calah and Assur were built after a common model. According to discussion of Andrew George, it may be that the extensive annexes on both temples' north front should be considered to have been given over to the writing, sealing and storing of state documents (George 1986: 141). The business of storing important state documents at the temple of Nabû is fitting for the god who as the successor of Ninurta is the divine patron of scribal arts and is often invoked as the "bearer of the Tablet of Destinies of the Gods". Such important state documents can be seen as the earthly counterparts of the Tablet of Destinies. Under Nabû's aegis important documents of state were drawn up and then ratified with Assur's seals which were kept in the temple of his sealkeeper (George 1986: 142). The destinies fixed annually in divine assembly was the divine counterpart of the practice and by sealing the Vassal Treaties Assur determined his vassals' destinies. The Seal of Destinies is impressed on the Esarhaddons's succession treaty. The inscription of this seal according to A. George "reveals the function of the Seal of Destinies to have been the sealing by Aššur of both human and divine destinies, as irrevocably decreed by him in his position as king of the gods. There can be little doubt that the document ratified by Aššur's sealing is, on the mythological plane, the Tablet of Destinies" (1986: 141). The second seal on Esarhaddons's succession treaty is the Old Assyrian seal of Assur of the City Hall according to its inscription. Thus in the City Hall of Assur (bīt āli), which was a part of Nabû temple and where Assur's seals were kept, the treaties and state documents were impressed with the seal of Assur of the City Hall and the Seal of Destinies. B. Pongratz-Leisten argues that the temples of Nabû ša harê were the actual place where adê oaths of the Assyrian crown princes took place and where the king received his sceptre from Nabu (Pongratz-Leisten 1994: 97). These Assyrian practices were modelled on Babylonian ones and probably derived from Sumerian practicies in Nippur. We can remind that an oath invoking Ninurta and the king was used on some Nippur sale documents and there is also a comparable evidence from the Ur III period that various foreigners and functionaries took an oath of allegiance at the accession of the new king in the temple of Ninurta at Nippur, as pointed out by Piotr Steinkeller (1989: 74 n. 209). Esarhaddon's succession treaty has still a third seal impression which shows the king kneeling between two gods. The seal impression has been recently treated by Ursula Moortgat-Correns (1995). According to her interpretation the gods are Adad and Ninurta depicted as the helpers of the king who stand on their symbolic animals. The sealing has been re-dated by her. It is not Middle Assyrian as Wiseman thought but it stems from Tiglathpilesar III. According to U. Moortgat-Correns' interpretation Adad and Ninurta on this seal are protectors of the king and his power. It is also possible to interpret that Ninurta on this sealing is protecting the succession treaty of Esarhaddon similarly as Ninurta's weapons protected the legal cases and oaths. Probably I was able in this short paper to demonstrate a continuity of concepts in the Mesopotamian traditions from the Ur III period until the Neo-Assyrian times. This continuity has already an amazing time-span and further studies can disclose additional aspects of this continuity. In my introduction to SAACT Vol. 3, I have discussed other aspects of Ninurta mythology. Annus, Amar 2001 "The Standard Babylonian Epic of Anzu" SAACT 3, Helsinki: The Neo-Assyrian Text Corpus Project. Artzi, Pinhas 1999 "Ninurta in the Mid-Second Millennium "West""; in: V. Haas, H. Kühne, H. J. Nissen, J. Renger (Hrsg.) Landwirtschaft im alten Orient, ausgewählte Vorträge der XLI RAI, Berlin 4.07-8.07.1994; Berliner Beiträge zum vorderen Orient 18, Berlin: D. Reimer. Cohen, Mark E. 1988 The Canonical Lamentations of Ancient Mesopotamia, Vol. I-II, Bethesda: CDL Press. Cooper, Jerrold S. 1978 "An-gim dím-ma: The Return of Ninurta to Nippur," AnOr 52, Rome. Dijk, Jan van 1983 Lugal ud me-lám-bi nir-gál; La récit épique et didactique des Travaux de Ninurta du Déluge et de la nouvelle Création. Texte, traduction et introduction. 2.vols. Leiden: Brill. George, Andrew R. 1986 "Sennacherib and the Tablets of Destinies", Iraq 48, 133-46.
idem, 1992 Babylonian Topographical Texts, OLA 40, Leuven. Gibson, McGuire 1993 "Nippur - Sacred City of Enlil, Supreme God of Sumer and Akkad", Al-Rafidan, Vol. XIV, 1-18. Grayson, A. Kirk 1991 Assyrian Rulers of the Early First Millennium BC; Royal Inscriptions of Mesopotamia, Assyrian Periods Volume 2, Toronto: University Press. Hallo, William W. 1985 "Biblical Abominations and Sumerian Taboos", JQR 76, 21-40. Lambert, W. G. 1971 "The Converse Tablet: A Litany with Musical Instructions", in: H. Goedicke (ed. ), Near Eastern Studies in Honor of William Foxwell Albright, Baltimore-London. Lieberman, Stephen J. 1992 "Nippur: City of Decisions", in: Nippur at the Centennial, Papers Read at the 35e RAI, Philadelphia 1988, 127-36. Livingstone, Alasdair 1986 Mystical and Mythological Explanatory Works of Assyrian and Babylonian Scholars, Oxford: Clarendon. Mayer, Werner R. 1992 "Ein Hymnus auf Ninurta als Helfer in der Not", OrNS 61, 17-57. Moortgat-Correns, Ursula 1995 "Zur Abrollung C auf den Vasallenverträgen Asarhaddons aus dem Jahre 672 zu Nimrud", SMEA 35:151-71. Pomponio, Francesco 1978 Nabû. Il culto e la figura di un dio del Pantheon babilonese ed assiro, Studi Semitici 51, Roma: Istituto di studi del vicino Oriente. Pongratz-Leisten, Beate 1994 Ina Šulmi īrub Die kulttopographische und ideologische Programmatik der akītu-Prozessionen in Babylonien und Assyrien im I. Jahrtausend v. Chr., BaF 16, Mainz: Ph. von Zabern. Reisman, Daniel 1971 Ninurta's Journey to Eridu, JCS 24: 3-8. Richter, Thomas 1999 Untersuchungen zu den lokalen Panthea Süd- und Mittelbabyloniens in altbabylonischer Zeit, AOAT 257, Münster: Ugarit. Sjöberg, Åke & Bergmann, A, 1969 The Collection of Sumerian Temple Hymns, TCS 3, Locust Valley New-York. Steinkeller, Piotr 1989 Sale Documents of the Ur III Period, Stuttgart: Franz Steiner. By Annus, Amar 2001, paper presented in the 47e Rencontre Assyriologique Internationale, July 2nd-6th 2001, Helsinki, Finaland.